I have a lovely little dessert to share with you today. 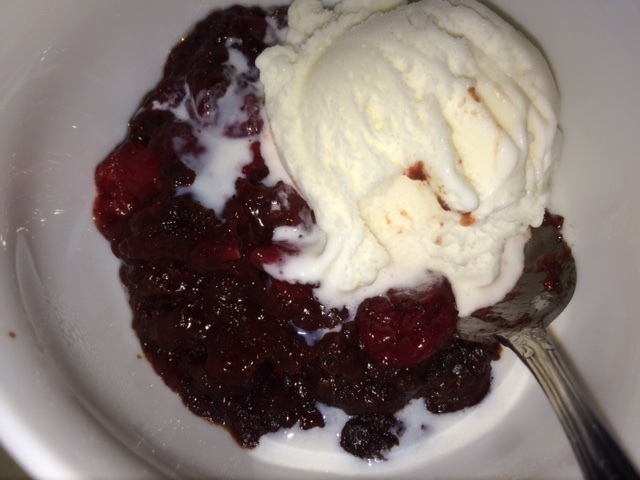 My Welsh friend and culinary twin Jo sent me the link to 19 wonderfully, sinfully easy dump cakes. The one I tried first was a cherry chocolate variety. Only three ingredients, yes…three! It can be prepared in under 10 minutes and bakes for 1 hour. This worked out splendidly as our son and his family came over for dinner last week. Our dinner menu consisted of grilled ice –box pork (I will definitely be writing about that later), baked sweet potatoes, green beans and rolls. 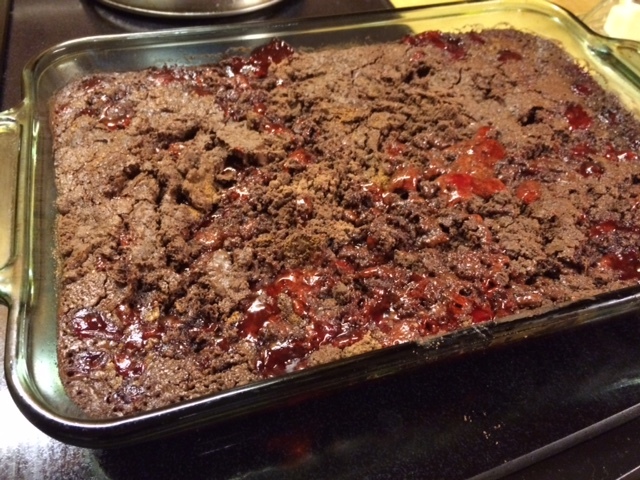 Once the oven was freed up from the sweet potatoes I simply popped the prepared baking dish with the luscious cherries and chocolate into the hot oven. It cooked while we enjoyed our dinner and conversation. Perfect, right?! A simple, 3 ingredient chocolate lovers dessert. Best served hot from the oven, topped with whipped cream, frozen vanilla yogurt or ice cream. And yeah….I know it’s a mix but sometimes there is a time crunch or you are just tired. This is perfect for an impromptu sweet. 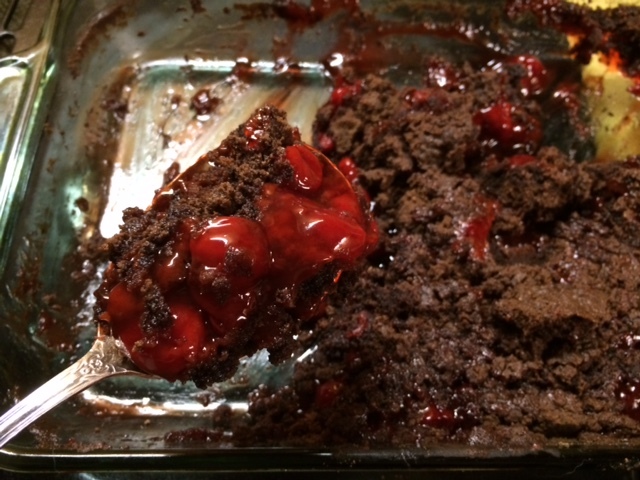 What I would do differently next time is only use 1 can of cherries and half the boxed cake mix. It made sooooo much. Even for four people it was way too much to have leftover. Next recipe from BuzzFeed will be the peach coconut. I gave the kids the choice of that one or the chocolate cherry. My daughter-in-law doesn’t like coconut and so that’s why we tried this one first. Can’t you just hear George Bailey from it’s a Wonderful Life. You know the scene where he’s fussing at Mary at the soda fountain counter? Young George: Make up your mind yet? Young Mary: I'll take chocolate. Young Mary: I don't like coconuts. 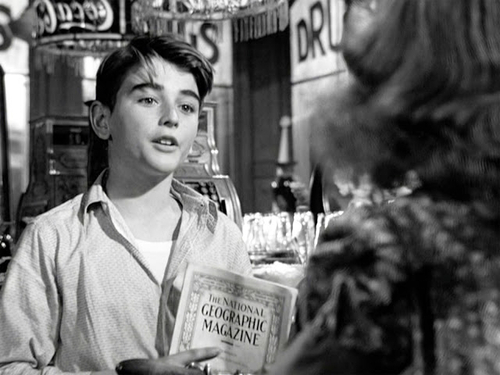 Young George: Don't like coconuts? Say brainless, don't you know where coconuts come from? [pulls out a National Geographic magazine] Look-it here, from Tahiti, the Fiji Islands, Coral Sea. Young Mary: A new magazine! I never saw it. Young George: 'Course you never. This is just for explorers. It just so happens I've been nominated for membership in the National Geographic Society. I'm going out exploring some day, just you watch. And I might even have a harem, and maybe even one or two wives. Anyway, next time I want to expand the waistline we’ll try the peach coconut variety. We just won’t have company and we’ll half the recipe. Ok, here is the recipe. Check out BuzzFeed and 19 Dump Cakes to see more. 2. Dump cherry pie filling into a 13x9 inch cake pan. Spread evenly out in pan. 3. 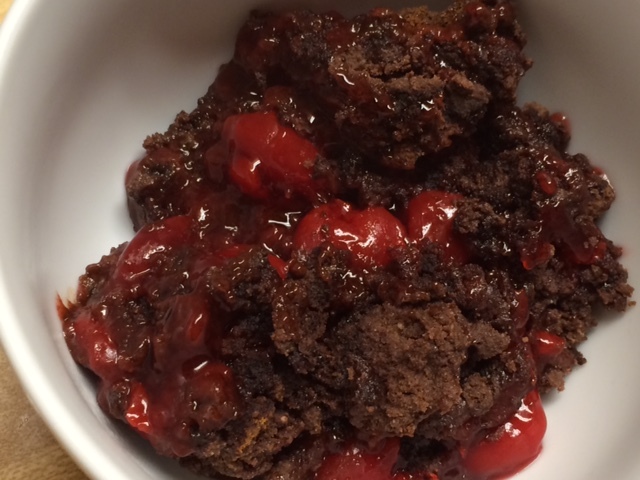 Top cherry pie filling with unprepared cake mix. Spread evenly as possible. 4. Drizzle melted butter over the top. 6. Serve topped with vanilla ice cream or whipped cream. 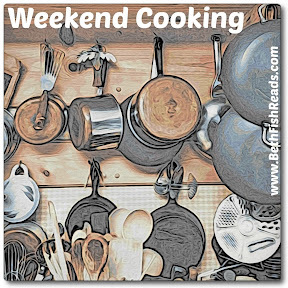 I am sharing this with Beth Fish Reads for her Weekend Cooking Series. That does sound like an over-the-top dessert! Mae, it made so much and it's so dense you don't need much.